Home Services Garage Door Springs Can I Use My Garage Door With A Broken Spring? Broken springs are a common and extremely frustrating problem that many homeowners encounter. Because these components have a limited service life, they will wear out and fail at some point if not replaced beforehand. If they snap completely, this can be very inconvenient. Although it might be tempting to try and open the door anyway, we strongly advise against doing so. What Do The Springs Do? Homeowners might wonder what the springs actually do - doesn’t the opener do all the lifting? Not really. The opener enables the automation behind the system but it isn’t strong enough to lift the door’s weight on its own. 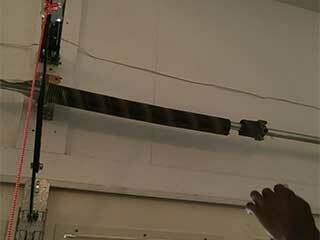 Garage doors need the springs to take the door’s weight which do so by counterbalancing it. If the spring fails, your door will very likely become inoperable. What If I Try To Opener It Anyway? Most likely, the door won’t move very much and your opener will become damaged. Typical doors weigh 150 pounds or more, and their openers are only designed to hoist a fraction of this weight. Unless you have a particularly light door or a very strong opener (or both), you’ll probably find that the door just doesn’t move. The opener may suffer damage as well. Can I Open It Manually? Some doors can be manually opened. However, be very careful if you decide to do this. The opener locks the door in position when it reaches the top of the tracks, but it won’t be able to do so without the springs. This means someone will have to hold the door up if you want to get your car in or out. These doors are extremely heavy, so you’ll need at least two people to support it properly – it's worth simply getting it repaired rather than attempting to do this. How Long Would A Replacement Take? We know how frustrating a broken spring can be, that's why we provide an emergency replacement service for our customers. If your spring has failed we’ll do our best to get to you the same day, and fit a new one according to our high professional standards.